Kennedy Space Center’s iconic Vehicle Assembly Building (VAB) is continuing its preparations to host the Space Launch System (SLS) and commercial rockets, with modifications from the ground up. The revamp includes a modernization of its inner workings, including the fire suppression system – a key safety element for the massive building. Ensuring humans and hardware are safe inside one of the largest buildings in the world is a challenge at the best of times, but the emphasis is increased when considering it is also the home of rockets being put through their final integration tasks ahead of launch. 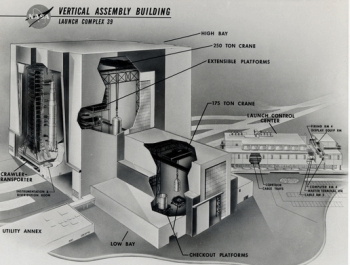 A large amount of safety protocols have always been in place for the VAB. However, the end of the Shuttle Program marked an opportunity to modernize and transform the building – and its safety systems – ahead of its next role. The launch vehicle integration facility was built in 1965 to support assembly of Apollo/Saturn vehicles and modified to support the Space Shuttle Program. At present, only SLS has been confirmed for using the VAB. However, it is hoped commercial vehicles will take up space inside High Bay 2 (HB-2) – likely those aiming to launch from Pad 39C (within Pad 39B) – with interested parties told they need to register their interest by mid-2016. Ensuring the rockets and workers remain safe inside the VAB involves numerous safety systems, not least the fire suppression system. 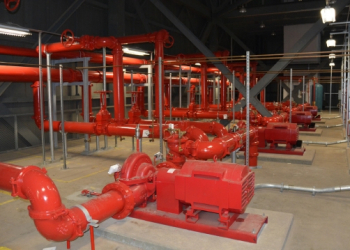 Ivey’s Construction is performing upgrades to the system, which includes new fire pumps, controllers and fire protection piping have been installed on level 20 of the VAB. The company has had more than 50 people working on the fire suppression project alone, which began back in late 2013 when the company performed an evaluation of the VAB’s “Firex” system. 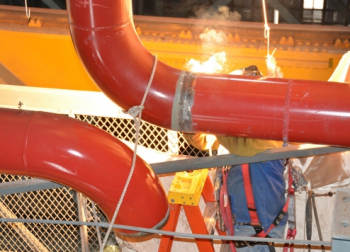 Work includes welds to 12-inch fire protection piping across the entry to VAB High Bay 4. A 1.4-million-gallon water storage tank also is being refurbished. Ivey’s Construction was founded in 1973 by Wade Ivey and is now owned by his son, Kevin Ivey. Ivey’s is a small family business that is involved with a number of KSC projects. 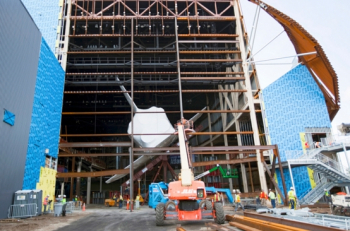 Historically, Ivey’s performed construction work at KSC from as early as 1975, as NASA began to convert the center’s facilities from the Apollo Program to the Space Shuttle Program. Over the years, the company has performed more than 1,000 new construction and construction renovation projects at Kennedy and Cape Canaveral Air Force Station. Working for NASA’s Ground Systems Development and Operations Program (GSDO), Ivey’s work in the VAB includes demolition of the existing fire protection systems, and diesel and electric fire pumps in the VAB, LCC (Launch Control Center) and Utility Annex. The company is also replacing more than 20,000 linear feet of fire protection supply piping, installing new diesel- and electric-motor driven fire pumps, controllers, auto-transfer switches, piping, power, and fire alarms. Ivey’s – which is a local company based at Merritt Island – is also performing work in other Kennedy facilities for GSDO, including Launch Complex 39B, the Launch Equipment Test Facility and the Operations and Checkout Building.